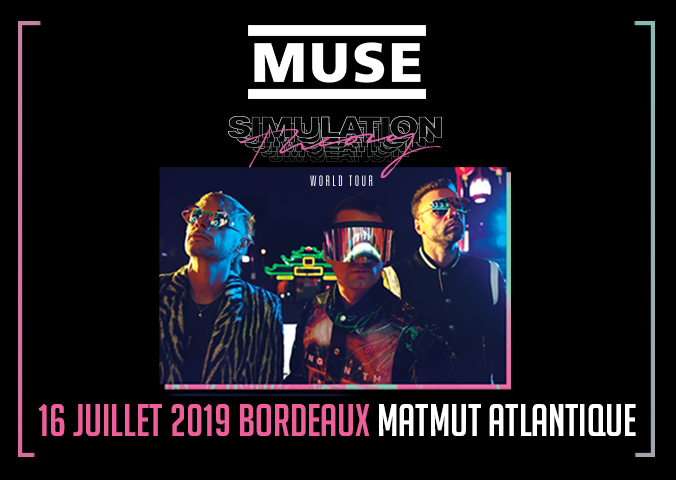 It is official: MUSE will be at Matmut ATLANTIQUE on July 16th, 2019! Matt Bellamy, Dominic Howard and Chris Wolstenholme are back for the Theory World Tour Simulation! They are making three exceptional shows on July 6th at the Stade de France in Paris, on July 9th at the Orange Vélodrome in Marseille and July 16th at the Matmut ATLANTIQUE. Since their formation in 1994 Muse have released seven albums and sold more than 20 million albums worldwide. Recognized globally as one of the best bands in concert, Muse has won numerous awards: two Grammy Awards, an American Music Award, five MTV Europe Music Awards, two Brit Awards, ten NME awards and seven Q awards, among others. Simulation Theory, their new album, is available since November 9th. To book tickets for the MUSE concert on Tuesday July 16th, 2019 at the Matmut ATLANTIQUE in Bordeaux, select the type of seats from the offer above. To pay them much too much. To not receive tickets or to receive tickets for seats of different categories from those ordered. These sites have no certain source of supply of official ticket and they are not able to guarantee the sold tickets. Ticket distribution sites that top search engine results when you search for a ticket are not necessarily licensed sites by the show's producer. Receiving a confirmation email is not a guarantee of a valid ticket’s purchase. For any other ticket distribution points, check with the show producer if the seller has been authorized by him by consulting the producer's official website or by contacting him by phone. The producer's license number and / or name appear on tickets and show posters. Suivez les lives des matchs, retrouvez le plan interactif du stade et toutes les dernières actualités. WHERE IS MY SEAT ? Do you want to know your seat for the selected event? You have bought your event tickets or your parcking tickets on our website? Need help for printing your tickets?